Potato salad makes the perfect addition to any warm weather meal for a neighborhood block party or a simple family dinner. 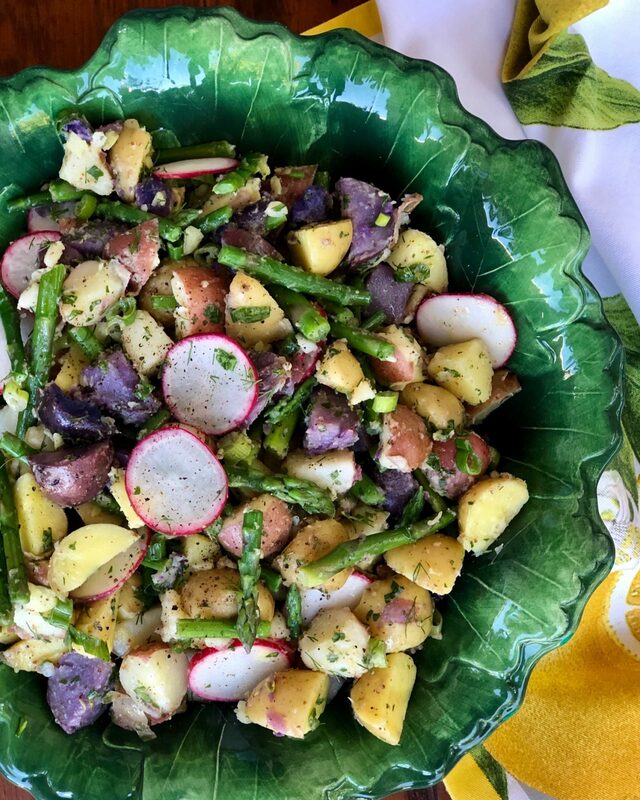 This recipe for potato salad takes it’s dressing from the French, and is filled with light flavors. A mustard-vinaigrette is used instead of gloppy mayonnaise, which makes for a delicious and light salad. Fresh asparagus and thinly sliced radishes give the dish color, as well as a little crunch. As I said yesterday, this time of year I like to incorporate as much fresh produce into my meals as possible, and this salad is a great way to do so. When it comes to picnics and cookouts – I usually leave the grilling up to my husband, while I tackle the sides. Since this recipe doesn’t call for mayonnaise, it is perfect for warm weather alfresco dining. 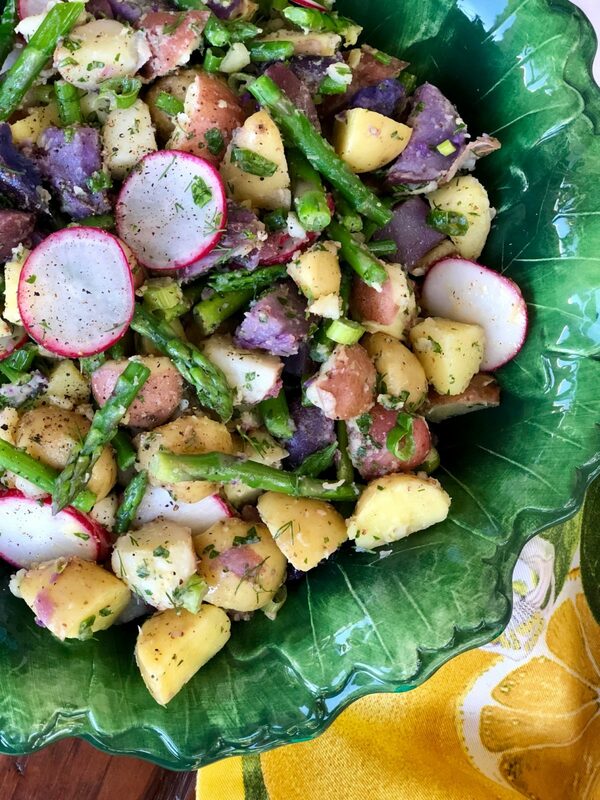 Sometimes potato salad can be heavy but this recipe makes the potatoes light, fresh and full of flavor thanks to spring veggies and fresh herbs. I love this type of salad because it can be made in advanced – in fact, it’s better when it’s made in advanced because the potatoes will absorb a little of the dressing. Drop the potatoes into a large pot of boiling salted water and cook for 20 minutes, until they are just cooked through. One or two minutes before the potatoes are done, add the asparagus to the boiling water. Cook for one minute. Drain into a colander. As soon as you can handle them, cut in 1/2 (quarters if the potatoes are larger) and place in a medium bowl. Toss gently with the wine and chicken stock. Allow the liquids to soak into the warm potatoes before proceeding. Combine the vinegar, mustard, and slowly whisk in the olive oil to make an emulsion. Add the vinaigrette to the potatoes. Add the scallions, dill, parsley, asparagus, radishes, salt and pepper. Serve at room temperature.